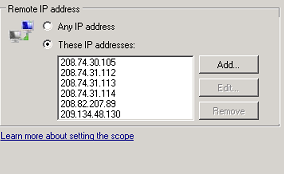 Back on older versions, SecureAuth did not whitelist these IP's on the Windows firewall. You should see an active rule called "SecureAuth - Allow Cloud Services". Open the properties for this rule. Go to the Scope tab.